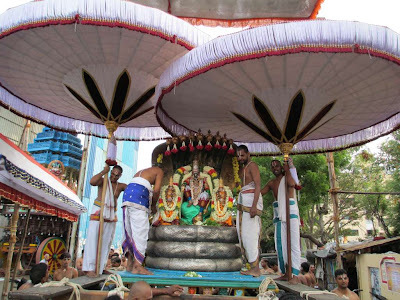 அணையாம், திருமாற் கரவு. – Muthal Thiruvanthathi, Poigaiazhwaar. 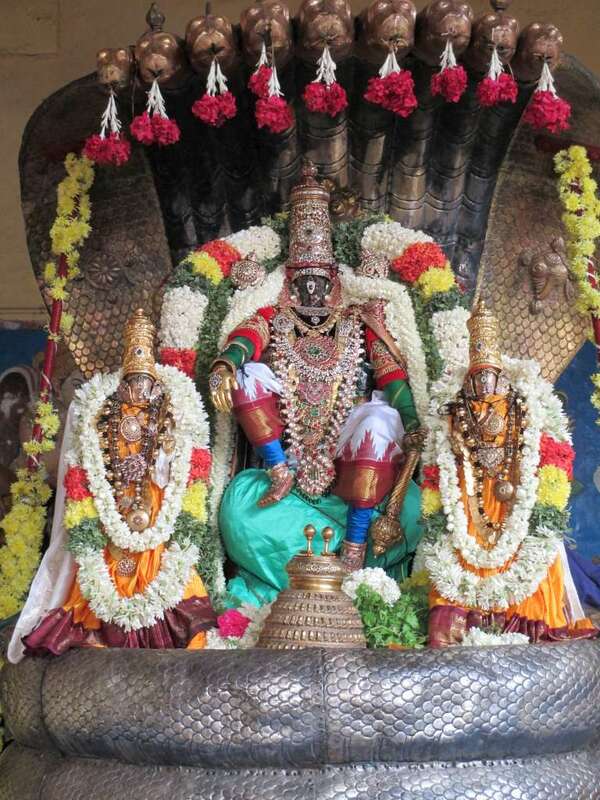 Of those who render service to Maha Vishnu, Ananthan – the snake serves Him in the best possible manner that one could visualize. When Thirumal is moving, Thiruananthazhwaan hoods him like a parasol, when God sits, Seshan is settee – the seat of comfort; when Lord stands, the snake serves Him as footwear ; in the Thiruparkadal where Lord reclines to take rest, he becomes the silken bed – he gleams with light and provides handrest too. The serpentine Ananthazhwaan is ever at the service of the Lord in every possible manner. திருப்பாற்கடலில் பள்ளி கொள்ளும் பெருமானுக்கு 'சேஷசாயி' என அழகான திருநாமம். 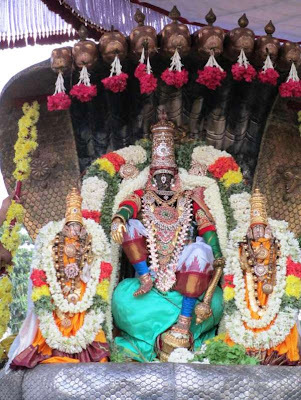 அந்த அரவணையானின் பாதங்களை தொழுது ஏத்துபவர்கள் என்று என்றும் குறைவிலர் ! 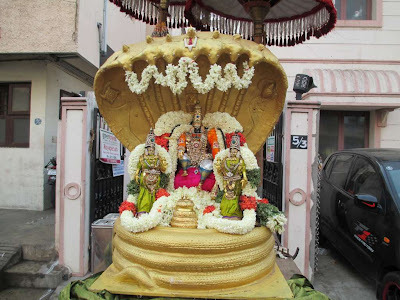 Today, [25th April 2013] on day 2 of Brahmothsavam of Sri Parthasarathi at Thiruvallikkeni divyadesam, it was ‘Sesha Vahanam’ and it was indeed a grand purappadu this morning. Here are some photos taken during the morning purappadu. 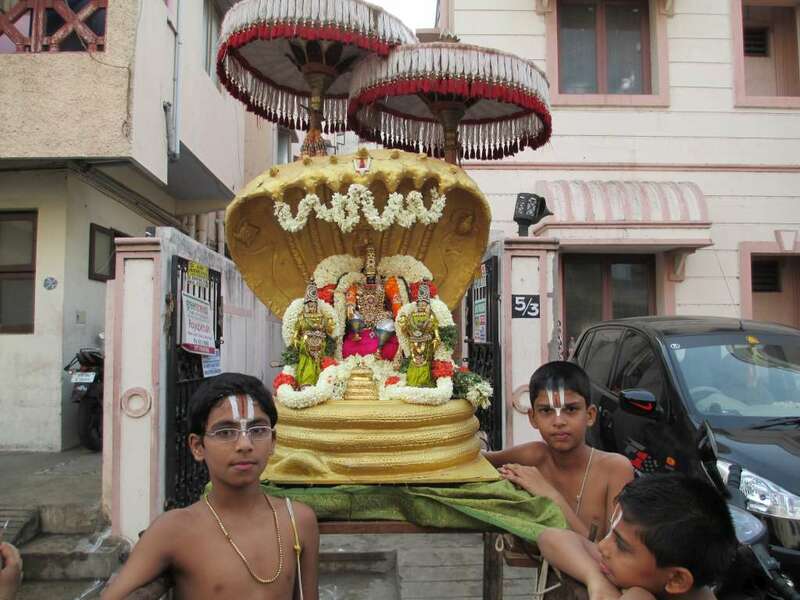 At a time, when modern children get glued to TV and computer, kids of Triplicane even in their play think of God….. the last 2 photos that you see here are ‘the Chinna perumal’ – kids made Sesha vahanam and Perumal – see how close to Original this Perumal also looks, and you can feel their involvement and commitment….